The Crocheter's Skill-Building Workshop is a fairly comprehensive book aimed at beginners, advanced beginners and intermediate crocheters, as well as crocheters that have worked off written patterns and are ready to start designing or adapting patterns to fit their own style. Full color photos with step by step instructions that are well written make it easy to follow, and the stitch patterns are in both international crochet graphs and American style text patterns. It starts with a review of the absolute basics, but also shows variations on those basics. For example, most beginning crochet books don't cover using a long chain instead of a turning chain to start a row for example. This one does, and shows how it works and explains the pros and cons of each method for starting a row. It also covers extended stitches and how to join in colors. Then it gets into various stitches, including specialty stitches like loop and knot stitches. Again the photographs and instructions are very clear. I've always had an issue with knot stitches, and these instructions taught me how to do them. A chapter on shaping and construction shows how stitches build and how to increase and decrease neatly. It also covers how to check gauge and why that's so important. Another chapter covers crocheting in the round using finished rounds, spirals and how to taper a spiral done with taller stitches. Advanced shaping covers all those edges- to create sharp darts, smooth sleeves and other details found in well-crafted clothing. It explains how to shape with textured or openwork stitch patterns. It covers internal shaping as well in pattern. Textured stitches are where crochet gets really awesome for me. It's the difference between boring and interesting for projects I make for my monochrome loving husband. 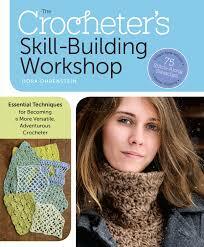 A full chapter covers things like popcorn, cables, crocodile stitch and crocheted ribbing. Color crochet has the standards like stranded crochet and color checks, but it also has some pretty spike stitch techniques and an easy 2-color diamond that's a lot of fun to stitch. Finishing techniques is seams, blocking and everything you need to do to put it all together and finish it. After that, there are a few projects so you can practice the skills learned. Textured stitches, internal shaping and ribbing are used in projects like a slouchy hat or a star stitch cowl. Like Storey Publishing on Facebook! Like Shala's Beadwork and Printables on Facebook while you're at it.